Airlander 10, an aircraft the length of soccer field and the height of a nine-story apartment building, has been towed from Britain’s largest airship hangar, in Bedfordshire, to prepare for its first flight. The craft is considered the largest airship in history, essentially resembling three airships in one, with rotary engines and rudimentary wings. — Chris Hubbard (@mrchrishubbard) 6 августа 2016 г. ​Dubbed “the Flying Bum” for a bulbous leading-end shape reminiscent of a human derriere, Airlander 10 will undergo tests prior to going aloft later this month, according to Britain’s Hybrid Air Vehicles, the airship developer. — Bedford Air Cadets (@AirCadets134) 6 августа 2016 г. The $32.5 million (£25 million) airship was in development for some ten years indoors prior to its presentation to the public: "Last week we successfully completed our final in-hangar all engines, all generators, all systems testing," Durham told the Mirror. Driven by thrusters and propulsion, it is claimed to be some 70% cleaner and quieter than conventional jet aircraft, according to the developers. 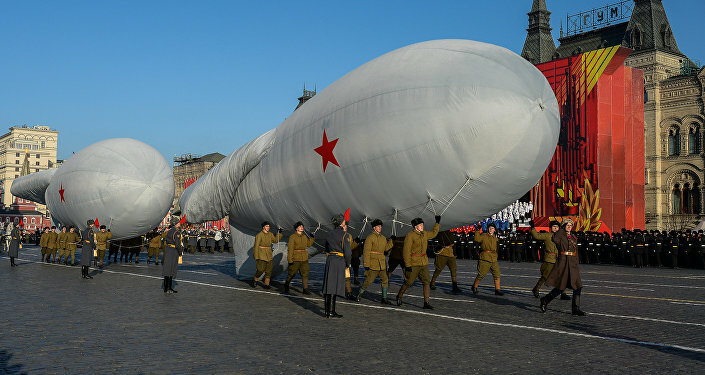 The airship can fly for five days and stay aloft for up to three weeks without refueling, Durham stated. Under company projections, the airship will transport cargo and passengers, as well as provide mobile communications. Other possible applications include surveillance missions and data collection studies, for both military and civil purposes, such as monitoring refugee flows from the Middle East to Europe. Hybrid Air Vehicles intends to construct twelve of the aircraft by 2018, some of which will be designed as transport vehicles with a capacity of 48 people, BBC reported.